We offer several options for shipping by the U.S. Postal Service. Generally, the less expensive options are slower and may involve a greater, though usually still neglible, potential for damage to your calendars. We pack orders carefully to insure that they will arrive safely and have had several year’s experience with very few problems, but can’t take responsibility for damage caused in transit by poor handling by the post office. Please note that you must have a mail receptacle that i s large enough to hold a 10″ by 15″ envelope, or should make arrangments with your postal carrier to leave the package in a safe location. We cannot take responsibility for damage caused if packages are left exposed to weather or theft. We do not insure shipments against damage or loss as a matter of course, but can do so on orders shipped within the U.S. at the customer’s request and expense. If you would like to have your shipment insured, please note this on the order form and we will contact you with the cost before processing your order. Insurance is not available on international shipments, and customs fees are not included in the shipping cost. First Class mail (tyvek envelope) is available for U.S. shipments of 1–2 calendars and international orders of 1–3 calendars. Domestic transit time is generally 3-5 days; it has generally taken 7–14 days at a minimum for international shipments to arrive, but transit times can be much longer. In particular, shipments to some Canadian addresses have taken 45 days or longer to arrive. Calendars are shipped in a flexible tyvek envelope with cardboard stiffening, similar to that used for high-quality magazines, and may suffer minor cosmetic damage during shipment (dinged corner, &c). That said, I have had no complaints of shipping damage using this method. If you do not want your calendar to be folded to fit in your mail receptacle you will need to speak with your postal carrier. Please note that I have no ability to track this class of mail internationally. I can supply my postage receipt showing when postage was ordered and the package mailed, but can't take responsibility for undelivered shipments. This is a much cheaper alternative than the First Class stiff envelope for international shipments. 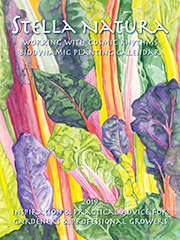 First Class mail (stiff envelope) is available for single calendar orders within the U.S. (mutiple calendars weigh too much to use this option) and 1–2 calendars on Canadian orders. It generally takes 3–5 days within the U.S. and 7–14 days for Canadian shipments. Calendars are shipped in a stiff envelope and marked with a “Do Not Bend” stamp, so you should plan to use a receptacle that is large enough to hold a 10″ by 15″ envelope. Media mail is available for U.S. orders of any number of calendars and is usually the least expensive shipping option. However, zone-based flat-rate priority shipping is less expensive when shipping 2 calendars and can sometimes be less expensive when shipping orders of 10–15 calendars to certain destinations. You will see this when you look at the shipping calculator. We will contact you with costs for orders of more than 15 calendars. Media mail generally takes 7–10 days, but transit times can be much longer to some locations or at certain times of the year. Priority flat-rate mail is used for orders of 1–25 calendars and varies in price depending on the number of calendars ordered and the destination. Orders of 1–2 calendars ship in cardboard envelopes with cardboard stiffening; larger orders ship in boxes. Can be used for U.S. and international shipping; tracking is availble to all domestic and some international addresses. Shipping via UPS is another option. This is generally more expensive on small orders, but can be an economical choice when ordering 50 or more calendars. Please contact me for pricing.